What do you get when you combine a wireless motion-sensing mouse, a computer keyboard and a PlayStation-style controller? I don't know, but it sure looks uncomfortable to hold. No matter our gaming platform of choice, we can probably all agree that different kinds of input devices are suited to different kinds of games. You can't beat a mouse/keyboard setup for an FPS, RTS or MMO, but fighting games, platformers and action games just feel better on a console controller. And then there's all this motion-control stuff that when used properly is pretty darn cool. So if you put them all together, then you'd obviously have the best and most useful gaming peripheral of all time, right? As it turns out - no, not so much. Don't get me wrong, I'm certainly not insinuating that the Veho Mimi isn't an interesting gadget. It has a full console-style controller complete with D-pad, two analog sticks and four shoulder buttons. It has a complete QWERTY keyboard with hotkey support. It even has an accelerometer, meaning it can be used as a mouse-slash-motion control device. This is kind of like the Voltron of input devices, when you think about it. It just looks ridiculously awkward and uncomfortable to hold. I've seen cinder blocks that looked more streamlined than this puppy. You'd have to have the hands of a giant to hold the thing in the first place, but then you'd need the fingers of a ten-year-old kid to use the keyboard. And if you're using the keyboard with both hands, how are you supposed to use the mouse functionality - and that's not even getting into the typical WASD/Mouse setup of an FPS. 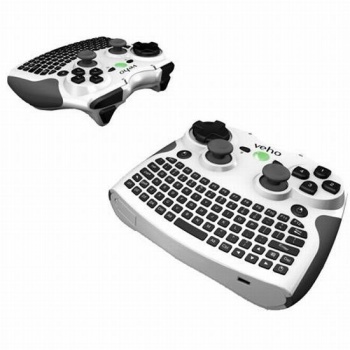 If you're dying to try the Veho Mimi for yourself, you can pick it up for $119.95. The device will last for 20 hours of continuous use on a 3-hour charge, though I'd be willing to bet most gamers wouldn't be able to last 20 hours holding that monstrosity. And we thought the Jaguar's controller was weird.